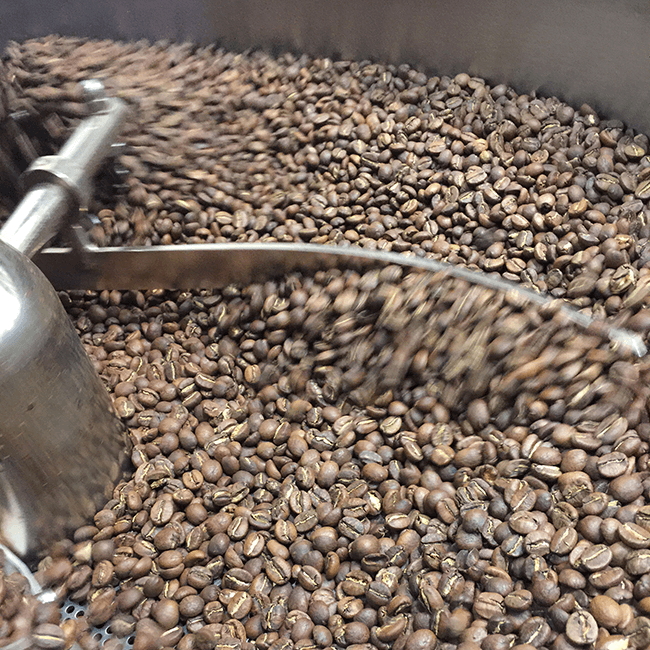 When people ask if we do a dark or light roast, we like to say that our method of roasting is the “right” roast for the bean. It falls around the medium area on the roasting spectrum - never a dark roast. Why? Because the darker you roast the bean, the more you burn the natural oils of the bean. Bottom line, burned oils do not produce delicious coffee. High quality coffee will be both flavorful and healthy when it is roasted correctly. Also, the darker the roast, the more the caffeine is burned out of the bean (making the coffee less caffeinated). As a result, a dark roast can never embody the true wonderful essence and highest flavor potential of the coffee. We roast our coffee exclusively using authentic artisan small batch roasting methods. Our roasting techniques enhances the roast development of the coffee bean, allowing the natural oils of the bean to reveal the full palate of flavors that each coffee embodies. Our passion is to roast coffee from different regions around the world – regions like Colombia, Panama, Ethiopia, Kenya, Costa Rica, Brazil, El Salvador, and Guatemala, and create blends that excite people. Each day, we brew a special A.M. blend and various other house blends and single origin coffees. Our cold brew and Nitro cold brew are served on tap (cold brew coffee is extracted in room temperature water for 16 hours to create an exceptionally smooth flavor and the Nitro is our nitrogen-infused version of this deliciousness). Our slow bar offers additional ways to savor a carefully brewed single cup with methods such as pour over, French press and Turkish coffee. Our organic, direct trade teas are outstanding - try our ceremonial grade organic matcha as a hot or cold latte - and our Turmeric Latte (iced or hot) is a healing and warm treat. The milks (dairy, almond, & soy) we use are organic, and we handcraft on our premises the caramel, chocolate, hazelnut, "nutella" and vanilla for our latte drinks to achieve the best optimal flavors. We also make an in-house hazelnut/almond nutmilk that is pretty spectacular. Coffee has always infused our daily life with the energy of happiness, clarity and productivity, and we feel immense appreciation and deep gratitude when our customers also experience this joy.